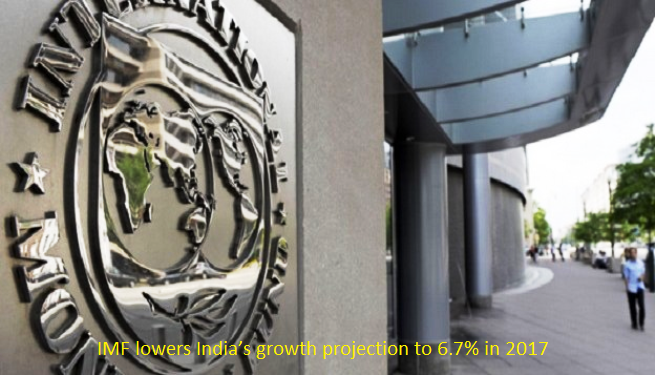 The IMF has lowered India�s growth projection to 6.7 per cent in 2017, 0.5 percentage points less than its previous two forecasts and slower than China�s 6.8 per cent, attributing it to demonetisation and introduction of the GST. The International Monetary Fund (IMF) raised its current year growth forecast for China to 6.8 per cent, 0.1 percentage more than its two previous projections in April and July -- pushing the Communist giant above India at the top of the global growth tally. It also lowered India�s growth for 2018 to 7.4 per cent, 0.3 percentage points less than its previous two projections in July and April. India�s growth rate in 2016 was 7.1 per cent, which saw an upward revision of 0.3 percentage points from its April report. In India, growth momentum slowed, reflecting the lingering impact of the authorities� currency exchange initiative as well as uncertainty related to the midyear introduction of the country-wide Goods and Services Tax,� the IMF said in its latest World Economic Outlook report. Strong government spending and data revisions in India led to an upward revision of 2016 growth to 7.1 per cent (6.8 per cent in April), with upward revisions of about 0.2 percentage point, on average, for 2014 and 2015,� it said. The latest report, released ahead of the annual meetings of the IMF and the World Bank in Washington this week, puts China slightly ahead of India in terms of growth rate for the year 2017. The Goods and Services Tax (GST) was implemented in India from July 1 this year. It brings the economy under a uniform tax regime. The Indian government scrapped Rs 500 and Rs 1,000 currency notes on November 8 last year, claiming that the move would eradicate black money, fake currency and corruption. Hit hard by demonetisation, India lost the tag of the fastest growing economy to China in the March quarter with a GDP growth of 6.1 per cent, as per the data released by the Indian government�s Central Statistics Office (CSO). However, India is likely to regain the tag of the fastest growth emerging economies of the world in 2018, with China projected to grow at 6.5 per cent in 2018, it said. The GST, which promises the unification of India�s vast domestic market, is among several key structural reforms under implementation that are expected to help push growth above eight per cent in the medium term, the report said. In India, simplifying and easing labour market regulations and land acquisition procedures are long-standing requirements for improving the business climate,� the report said. Between 1999 and 2008, India on an average grew at a rate of 6.9 per cent, the IMF said, adding that for the next three years its growth rates were 8.5 per cent in 2009, 10.3 in 2010 and 6.6 in 2011. In the years 2012, 2013 and 2014 it grew at a rate of 5.5 per cent, 6.4 and 7.5 respectively. In 2015, India clocked a growth rate of 8 percentage points. For the year 2022, the IMF has projected a growth rate of 8.2 per cent, as against its growth projection of 6.7 in 2017 and 7.4 in 2018.